Fitting flush to the wall in a pyramid fan shape, the Fireglo shade has a main base colour of cream, with a small base edging in flame colours and a deep border with green insets. Many Art Deco styles were based on Egyptian designs. 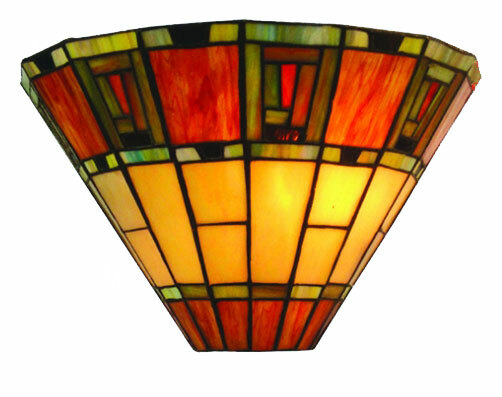 The Fireglo Tiffany light has wonderful Egyptian style and lives to its name with a deep border of burning flame colours. A stylish Tiffany wall lamp full of modern Deco style colours. The Fireglo wall bracket, part of our Art Deco style Tiffany lighting range. An absolutely ideal choice for the sunny conservatory. Hello Paul. The bracket is made of pressed steel while the shade is made of glass which is held together with lead free solder. The wall light weighs 0.7kg.